Flick down with two fingers on a trackpad or Magic Mouse in Mac OS X and you’ll experience inertial scrolling, where after your finger has stopped moving the page continues to scroll in the intended direction until it slowly stops. This fluid and natural scrolling experience comes from the iOS world, and while it works quite well on the desktop, it’s not for everyone. Intertial scrolling is now off. Try to scroll now, and even if you flick your fingers the scrolling will end immediately when you lifted them from the trackpad, just like it’s 2005 again. What about inertia scrolling in older Mac OS X versions? Note that in Mac OS X 10.6 Snow Leopard, intertial scrolling was called “scrolling with momentum” instead, and the option was contained within the standard Trackpad & Mouse preference panel. 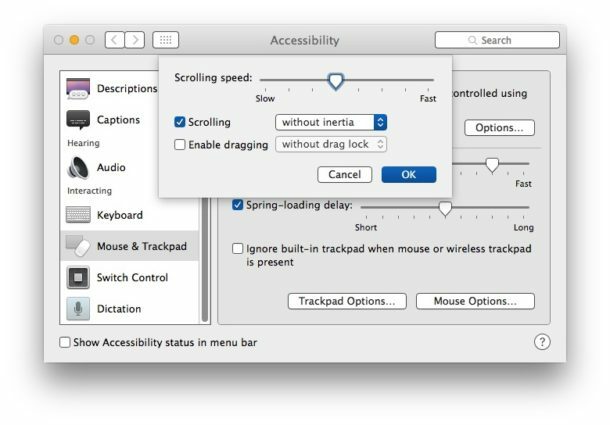 From OS X Lion onward through OS X Mavericks, El Capitan, Sierra, and onward, it’s simply referred to as Inertia Scrolling, but disabling it remains an option if you’re not a fan of the behavior. Alternately you can enable inertial movement of everything! If you hold two fingers down and us another finger to move them. Some features use different amount of fingers depending on the gesture. How is it possible to turn on/off this scrolling automatically when I switch to certain applications (like Illustrator) ? I love scrolling with momentum but how do I disable that annoying bounce once the end of the content is reached? That is probably the best option to disable the trackpad but aside from that it would be a bit technical to attempt to force it to not work. Some users physically disconnect the camera in their computer, for example, which could be applied to the trackpad as well, but that is obviously extreme for something like this. The intertia options aren’t there for me. I’m running El Capitan, but I don’t have a trackpad, and therefor no “trackpad options” either. However, the mouse also has interia scrolling, which is just as irritating. But mouse options doesn’t show an intertia checkbox. There are no options in “System Preferences–Accessibility–Mouse and Trackpad” to turn scrolling off. It’s still driving me mad! When using Adobe Illustrator it swings the canvas all over the place and zooms out when it wants to – especially when I’m using keyboard and mouse to re-scale an item.